The Mighty Nein face down the aquatic guards at the entrance of Uk’otoa’s sunken temple. The guards use their piscene abilities to stun and paralyze Beau and Jester, but they manage to shrug off the effects and retaliate. Once the guards have been dealt with and everyone healed up, The Nein begin to explore the temple. With Nott’s help, they manage to find a hidden passageway through the seaweed. Caleb and Fjord find the buried notch where the next Cloven Crystal must be placed. Caleb watches as Fjord places the crystal into the altar. Fjord’s vision begins to go dark and Uk’otoa appears in a vision. Icy cold tendrils wrap around his body as everything begins to go numb. Watching. Adapt. Reward. Uk’otoa seems to fight and break free of several binds and a scaled tail grabs him. Fjord sees a bird’s eye view of three coastal cities. A beautiful white light in the nearby forest or jungle catches his eye. He knows this is the location of the final temple of Uk’otoa. The white light becomes blinding and Fjord returns to consciousness in the temple as the ground begins to shake around him. The ocean around them becomes a geyser and the temple begins to disintegrate. Jester saves the other members of the Nein with well timed control water wall and they escape to the surface. Fjord and Caleb follow closely behind. Safely aboard the Ball Eater, Fjord explores his newfound abilities. He can now control water much like Avantika after her offering to Uk’otoa. The Nein ask Fjord where they will go next and he suggests checking back in with the Empire and several of the Nein’s home cities. Caleb, Beau, Nott and Jester all have homes that may have been affected by the Xhorhasian invasion. Fjord agrees to quietly return to Nicodranus, check in with Jester’s mother and perhaps carry on from there. The Nein agree and the ship begins to make way towards the mainland. Just as the Ball Eater begins the trek, another ship appears from a hidden alcove. It bears no colors and begins to make towards the Ball Eater. Fjord gives the order to outrun the other ship, but it still pursues them and begins to open its cannon ports. The Nein leap into action and Nott begins to load cannons. Caduceus concentrates carefully and begins to control the water around the other ship, suddenly capsizing it on the rocks. Just for good measure, Nott fires off several cannon shots and damages the hull of the sinking ship. The crew of the Ball Eater turn back and begin to round up any survivors as captives. After a brief interrogation, Fjord agrees to set the pirate crew free, seeing as they no longer pose any threat to anyone. Jester gives a parting TuskTooth tattoo to one of the crew members and they leave the crew stranded on the island. As the ship makes the several day journey to Nicodranus, Jester and Caleb forge ownership papers for the Ball Eater. Fjord gives ownership of the Ball Eater over to Orly while they are away, telling the tortle that he can do as he pleases with the ship as he has been a loyal and valuable companion. Orly thanks him and graciously accepts ownership and says the he will always be there should Fjord need him in the future. The Nein prepare themselves to return home to the Empire and face the war on their doorstep. We’re coming home! After 13 episodes of pirate life and all the adventures that came along with that, The Nein are coming home. What an arc! And we haven’t seen the last of Fjord’s quest and Uk’otoa’s final seal. This arc has been one of my favorites from both campaigns. On par with the Briarwood arc or the lead up to the final Vecna arc. I am ready to see where the story goes now, especially with the war being so close to home. We have so many things to explore! The character development in this episode was wonderful. Beau revealing that she has basically been disowned and forgotten now that her mother and father have had a male child. Nott wanting to try and find the halfling man that was imprisoned by her goblin clan. Fjord basically turning tail and running from the final seal of Uk’otoa. And Caduceus with that sneaky divination on Vandrin! Caduceus knows much more than he lets on. Ugh, and I am still heartbroken over Yasha’s backstory reveal from last episode. Ashley Johnson better be able to return soon so we can explore more about the mysterious fallen Aasimar Yasha. 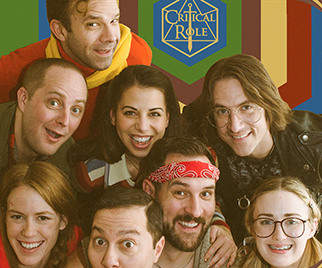 This next week is a jam packed one for the Critical Role cast. Episode 48 airs Thursday the 17th at the normal time. Friday the 18th is the opening of the Critical Role Fan Art show in LA. AND THEN Saturday the 19th is the Vox Machina one shot The Search for Grog! We're going back to Nicodranus! Ashley Johnson where are you? Wow! Finally I got a webpage from where I know how to in fact get helpful data concerning my study and knowledge. What’s up to all, the contents present at this web site are in fact remarkable for people knowledge, well, keep up the nice work fellows. I am not positive the place you’re getting your info, but good topic. I must spend some time learning more or figuring out more. Thank you for magnificent information I used to be looking for this information for my mission. Hello, of course this piece of writing is really fastidious and I have learned lot of things from it concerning blogging. thanks. I’m impressed, I have to admit. Rarely do I come across a blog that’s equally educative and entertaining, and without a doubt, you’ve hit the nail on the head. The problem is something which too few people are speaking intelligently about. I am very happy that I stumbled across this in my hunt for something relating to this. Tremendous things here. I’m very happy to peer your post. Thanks a lot and I am having a look forward to touch you. Will you kindly drop me a e-mail?